The case studies seem wrong or outdated. A debit user can only accrue $500 worth of debt with AfterPay, while a credit card user can accrue up to $1,000. These may be scaled up if the user develops a good 'credit history' with the company by transacting and not paying late fees. However it does not sound like these users would fit this category. Also AfterPay is a one-bitten-twice-shy lender, they won't loan to you after one late payment and only charge you a modest late fee. They really have no incentive to support loans that can't be paid back. Thank god we have people like you John! A lot of bulls say Afterpay is a super duper high tech product but IMHO it has the lowest tech out of the WAAAX companies. It is just another pay day lender which will follow the credit cycle (but much harder than tier 2 banks). Figure 10 needs to be put into context. Brighte provide finance for rooftop solar installations, Certegy provide longer term interest free finance. The amounts and terms of their loans mean their position is much worse than Afterpay. A late payment for Afterpay is for a small amount and is capped at 25%. A late payment for Brighte and Certegy is a large amount and uncapped. Furthermore, given the terms, not all users even have a payment due - so the percentage is misleading. It appears their loan book is impaired much worse than APT's. 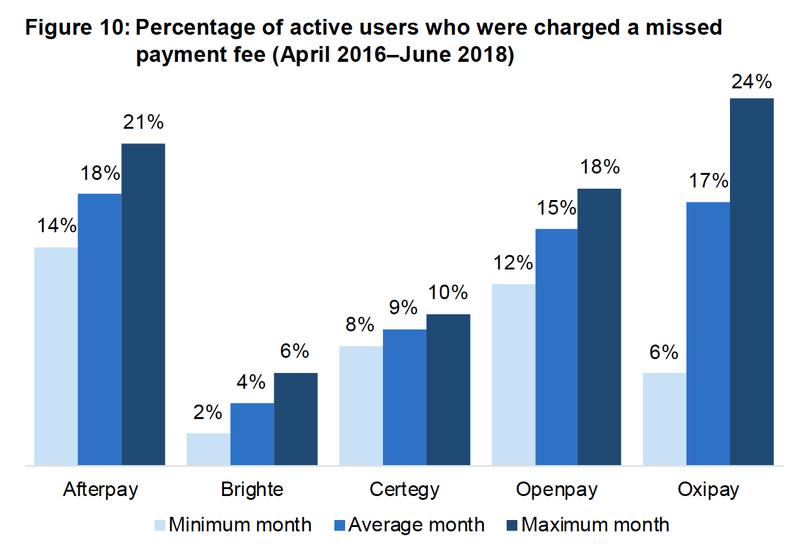 It seems that the only reason Afterpay can afford to provide the relatively less punitive credit terms to borrowers is because they are charging merchants much high transaction fees than other payment methods. Currently, most of the merchants are not passing through the cost to consumer via surcharge as it drive incremental sales. Thus, the cost of Afterpay is hidden. But, as Afterpay become bigger, the high transaction fee will become unsustainable and merchant will start charging an Afterpay surcharge. Thus, those with good repayment history will leave the platform to avoid the surcharge and you are left with subprime borrowers on the platform. Which scenario do you think will play out as the trajectory to zero is different? a) Economic downturn result in spike of credit cost and the stock goes to zero. b) Afterpay continue to grow to a much bigger scale which cannibalize merchants existing sales. Merchant have to pass on the higher cost to consumer. Good customer starts to leave while the subprime borrowers remain at the platform. Credit cost spike, stock goes to zero. Scenario (b) would take longer to play out and could go to 100 before it gets to zero. Each of those examples deals with borrowers with less than $20k AUD in debt and they report feeling overwhelmed by the magnitude of the problem. The average student loan burden in the US is $37k USD. We've just become numb to it over here. ASIC data states minimum 14% customers getting late fees each month. These are unlikely to be all the same customers each month given what we know about the underwriting standards and APT's policy of cutting off non-payors. They are also unlikely to repay the debt they owe for the same reasons. Assume that 20% of customers defaulted in total in H1 2019 (conservative). From the H1 release we have bad debt expense of $27m and average customers of 2.7m ((3.1+2.3)/2). If 540k defaulted then they owed on average $50 each. This seems way too low given the three case studies above quote balances owing of ~$1k. Try again, assume metric is % of active customer incurring late fee by month end rather than within the month. Assume 14% is in June 2018 to be conservative but also assume all these are bad debts. Total bad debt expense over all time to the end of June 2018 is $41.4m. Customers at 30 June 18 is 2.3m, 14% is 322,000 and bad debt per customer is $129. Still seems pretty low. Of course if there are lots who get late fee then become performing the result is more reasonable. Duncan - the reason you could well be wrong in your comment is that customers might be using this month's paycheck to pay last month's afterpay, leaving them with no money and the necessity to use afterpay again to pay for this month's expenses, etc. Afterpay's algos will say this customer is a reliable payer and grant them increased credit lines. In the company's presentation it boasts of higher usage by customer cohorts over time. So what could be happening is customers are slowly but surely going deeper and deeper into debt and getting in over their heads. APT could suddenly suffer a wall of unanticipated defaults at some point - especially if the economy rolls over. This is the dynamic that has sunk many financing companies and APT is run by young kids with no credit cycle experience.